Excellente situation dans la vieille ville, très pratique. Un confort minimum suffisant par rapport au petit prix des chambres. Chambres et salle de bain commune très propres. Parking de l'université à proximité gratuit. Dotées d'un balcon et revêtues de carrelage, les chambres disposent du chauffage, d'une armoire ainsi que d'une salle de bains privative pourvue d'une baignoire et d'articles de toilette gratuits. Sur place, vous pourrez profiter d'une bagagerie, d'un bureau d'excursions et d'un parking fermé pour vélos et motos. Enfin, l'établissement se trouve à 2 minutes de marche du théâtre Mercè et à 5 minutes d'un parking pour voitures. L'accueil de la dame. Le prix. La situation, au cœur de la ville. Les chambres sont grandes. Les chambres sont très mal insonorisées. Petite ruelle,impossible d'y accéder en voiture et de se repérer avec un GPS. Erg kleine kamer zonder raam. Behoorlijk gehorig. Bien - mais ne pas s'imaginer trouver les prestations d'un hôtel car la déception peut s'avérer sévère. Pas de gel douche fourni. Mal insonorisé. La situation en plein centre ville de Gérone, la propreté de l'établissement, la gentillesse de la gérante. The location is great, right in the old town. The staff is very helpful and patient. The room is clean and facilities are basic. The noise from neighbour rooms was horrible, which made this hostel almost impossible to stay. Everyone seemed to be affected, as we can hear coughing, door-smashing, water flushing, talking from different directions, even at 3, 4am. Or maybe we just had a bad luck? Definitely won't stay there again though. Super asukoht vanalinnas (auto peab parkima paarsada meetrit eemale, kus päeval tasuline, öösel tasuta). W samym centrum,czysto,cicho i spokojnie. Molt ben situada. A ple centre. Es un hotel que en el dia 31 de diciembre estuvo a nuestra total disponibilidad. Para llegar hemos necesitado 35 minutos desde la estacion de autobuses, pero bien es cierto que la recepcionista nos ayudo, ademas las paredes son muy delgadas, ya que a las 5 AM una pareja se dispuso a realizar el coito y se escucho por todo el hotel. Gelegen in een wijk met veel restaurantjes en winkeltjes. Goedkope overnachting. Aardige vrouw die me bij aankomst hielp. Ik hou niet zo van lakens met een deken erop, heb liever een dekbed. Erg gehorig complex. Good location next to old town. Really cheap, Clean rooms, Nice english speaking staff. It might be hard to find that pension. There is only small sign on the street. Все хорошо за свои деньги! to jest mieszkanie w kamiennicy zaangazowane na hostel. Moj pokoj byl bez wlasnej lazienki. Niestety jakiekolwiek wyjscie do lazienki w nocy skutkowalo obudzeniem zony;) Drzwi stracznie trzaskaly przy zamykaniu. The location and the cleanliness of the pension. The staff were helpful and friendly and the room provided what I needed for the short stay and on a budget. It was a particularly noisy place. Noise travelled from the lanes in the late and early hours and the movement within Borras was quite noisy particularly with guests leaving and arriving in late or early hours. Hostel jest w samym centrum starej Girony, co bardzo ułatwia zwiedzanie jej pięknych zabytków. Idealny na 1 noc w Gironie. Na tym kończą się jego zalety. W opisie hostelu jest informacja, że każdy pokój posiada łazienkę. W rzeczywistości część takie aneksy łazienkowe posiada. Inne pokoje dedykowane są "wspólnej łazience", która nie jest zbyt często sprzątana. 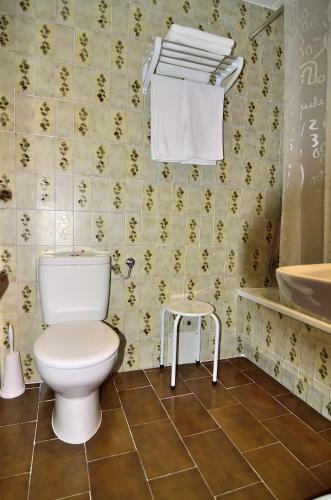 Osobno jest WC oraz wanna z natryskiem. Wybierając taki pokój trzeba pamiętać o własnym papierze toaletowym. Pokoje przestronne, lecz bardzo spartańskie. it's very close to the touristic centre and all places of interest. La ubicación. El espacio de la habitación. Que sólo estan unas horas para darte la llave. Si llegas antes no puedes dejar el equipaje.Solo las habitaciones grandes son exteriores. Me dieron una interior. La ubicación y la amabilidad de la señora que nos atendió. Poca cobertura telefónica y de internet. The Hostel was really clean and quiet. Near to the center of a town, and quite near to bus and train station! A bit noisy, big old building echoes a little. 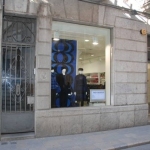 - Location is perfect, it's like 10 seconds walking to the old city center, - 10 minutes walking to the bus and train station, - very cheap, -cozy and spacious rooms, - clean and big bathroom, - stuff is very friendly and helpfull - I get lost in Girona, and the lady in the hotel guided me by phone directly to the Pension although she didn't know english good! 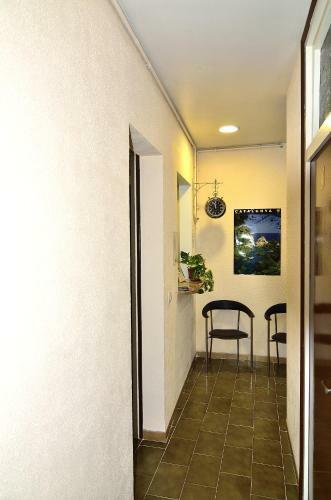 The pension was spotlessly clean and well cared for, and has wifi, despite previous reports. The lady who welcomed me was very friendly and extremely helpful in advising where to go for a reasonably priced meal. 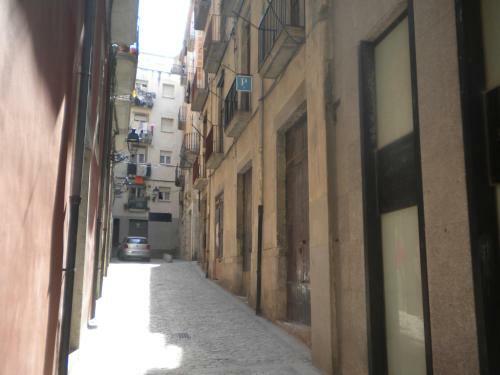 The location was right in the centre of the old town, approximately 2 minutes from the tourist info centre, yet on a quiet residential 'alley'. It took some finding at first as the tourist info map was poor but local people were very helpful in directing, one without me even asking! Trying to find it led me through some of the most amazing Girona sidestreets though and was well worth it! For reference the easiest way to get there is from Placa Pont(? ), turn up the lane 'Carrer Albereda' on the right hand corner (with the river behind you), and take the first lane on the left. The pension is on the right, just before the next lane junction. Placa Pont is the first square (or wide street!) on the left as one leaves the tourist info office and heads towards Placa Catalunya. It was strange having a room without a window at first but it was so comfortbale it didn't matter, and after all it was a place to sleep. If you are a light sleeper the noises form other occupants opeing and closing doors etc may be a problem. Bathroom facilities were basic but being so spotlessly clean made them welcoming, and for such a cheap price, one can't complain! 1. Very friendly and helpful staff. The lady who welcomed us was very nice with a warm smile. It made us feel like home. 2. Comfortable and pretty rooms with clean bathrooms and all facilities you need. 3. In the center (old town) of Girona. Het zag er erg netjes uit, en de mensen spraken redelijk goed engels, in tegenstelling tot het informatie kioskje op het centraal station van Barcelona! Het was een beetje moeilijk te vinden, omdat iets op een a4'tje stond in het spaans waar we moesten zijn, maar de dag erna was dat al netjes opgelost en stond het in eng, du, fa en spa! Ook goed gedaan. 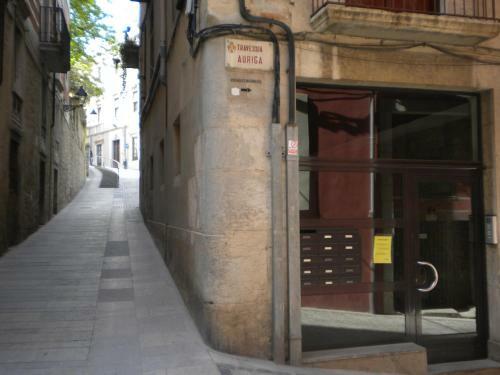 Despite the hostel is in very small alley it is still in the centre of the city, 10 minutes from train station by foot and in the edge of gothic quarter. Area is very quiet. Quite clean rooms and bathrooms. Very friendly staff. Quite fast WiFi. Lack of common area or a kitchen. Very thin walls (could be a little noisy because of other guests). There is no reception area, so after 8p.M. there is no one who could You open - during my visit very late travellers were knocking and ringing to the doors without a response... But - all of these information You could find in the description of the hostel so I personally wasn't suprised! The location in the historical center, right near the old city wall. Old building, room is a part of a flat. Normala place to spend one night before the plane. Heard the noise from other rooms all night, couldn't use the Internet. 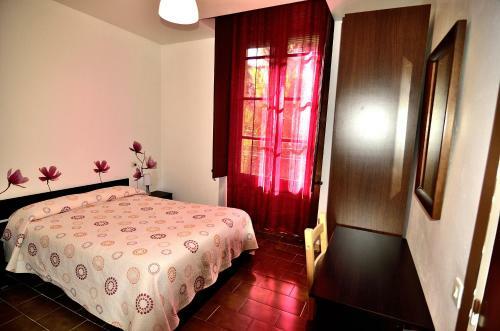 Nice landlady, clean and central room. Dark and tiny, but the price and location beat that easily! Tiny room with no wardrobe but as only there one night while waiting for flight home it was OK. Located in the main center in a street far from tourist noise. I went with my baby, Single room maybe too small but excellent price so, don't discuss about it! Place is very clean, in a central of the old part of the city. Staff very friendly and willing to help. хороший вид из окна на тихую улочку. недорогой вариант для бюджетного отдыха. Переночевать на 1-2 ночи вполне приемлемо. Очень сильно мёрзли: в начале мая в комнате было холодно, батарея уже не работала. Вечером из горячего крана текла еле тёплая вода. En pleno centro, habitación limpia, correcta y personal muy amable. La posizione della pensione è ottima,a pochi minuti a piedi dalle attrattive della città ed è situata tra stradine strette e caratteristiche.Per essere una pensione ad una stella ho trovato comfort e pulizia...senza dimenticare la gentilezza,simpatia e disponibilità della signora della pensione.Ci soggiornerei di nuovo. For 40EUR/night it is an good place to stay for a night or two (but not more). 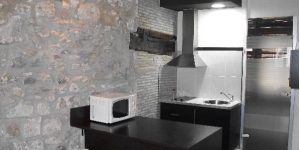 It is clean and quite comfortable, and it is in the old town of Girona. 1) Administrator of the pansion, despite being very kind and friendly, almost doesn't speak english. Very nice lady not actually on the premises of this collection of rooms -They are in an offshoot of a residential building.Very complicated procedure involving keys and directions if you happen to arrive when this lady is not there! Very small room and no T.V. Recommended only to someone who prefers somewhere inexpensive. Niski standard ale wystarczający na krótkie wizyty, brak recepcji całodobowej - problem jak przylatujesz późnym wieczorem. Good location in the center of the city. Clean recently renovated rooms. There is noone ever staying at the hotel and on the arrival you have to call the lady to let you in. Not very clean shared facilities. Not good communication in English. Hostel położony w wąskiej uliczce w samym centrum Girony. W pokoju nr 9 było nowe łóżko z super wygodnym materacem oraz poduszkami. Mimo starego wystroju bardzo czysto, w pokoju czekały czyste ręczniki, w łazience szampon, żel pod prysznic (dla zapominalskich). Starsza Pani, która nas przyjmowała była bardzo pomocna. Słabo zna angielski, ale bez problemu udało się nam porozumieć. Jeśli ktoś szuka taniego I czystego miejsca, bez nadmiernego luksusu to zdecydowanie polecam. Ze względu na stare drzwi I zamki słyszałem, każde przekręcenie klucza w nocy. W pokoju nr 9 nad drzwiami dodatkowo są szklane szyby, przez które w nocy wpadało włączane na korytarzu światło. De kamer en badkamer waren erg schoon. Het pension ligt midden in het historisch centrum en we waren alleen 's nachts op de kamer, dus al die luxe hadden we niet nodig en het was prima voor 2 nachten. Mochten we nog eens langer gaan, dan kiezen we een ander hotel. Dat je er niet kon ontbijten vonden we ook geen punt, want het is veel leuker om een klein barretje te zoeken waar alleen Catalanen komen. 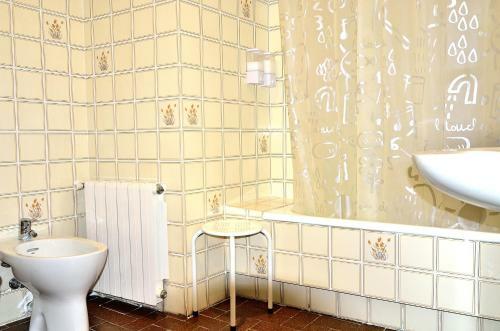 De kamer was erg basic en krap voor 3 personen, de badkamer was aan renovatie toe en het bad was een kleine vierkante bak die al eens zeer lelijk was gerepareerd. De douchekop kon je niet ophangen, dus haren wassen ging amper. Er was maar een klein rolletje toiletpapier. Er was een balkonnetje maar daar kon je niet op zitten. Je kon er niet ontbijten. Location! And it was clean. I did not like room without windows! It was one of the smallest rooms I ever had in my travels. Very claustrophobic! Maybe in Hong Kong was a bit smaller. It was 2,5m x 1.5 m room!!! No TV, no WI-FI, no sink the room, no towels..., as it was in single room in Barcelona for the same price! There is no reception in this hostal. When i came I had to go to other hostal to get the keys. неплохой чистый номер, расположение в исторической части города, недалеко от вокзала (быстрым шагом 10 минут). нет ресепшена, чтобы заселиться, нужно звонить по телефону сотруднице отеля, которая практически не говорит по-английски. в электронной переписке сотрудница отеля сказала нам, что после звонка по прибытии заселит нас в течение нескольких минут. но когда мы позвонили, сказала, что заселит через 30 минут, пришлось ждать под дверью. la calefaccion apagada al llegar y tiraba muy poco. En el cuarto de baño no hay radiador. Por suerte hacen la cama con muchas mantas y capas y es soportable, pero se roza el pasar frío. Mi habitación era con baño dentro (algunas lo comparten). Muuuy límpio, personal súper correcto, cama comodísima, el detalle de poner cortinas y decoración de vinilos, el mobiliario de la habitación está en buenas condiciones. Ubicación muy buena para salir a cenar + teatro + copas. Muy bueno para estar de paso. Se oye tooodo (a mi me gusta dormir con tapones, así que no tuve problema, aunque te quita intimidad), el baño está muy viejo, aunque funcional (por favor, que quiten el armario del baño que hace de espejo, en Ikea hay espejos por 7€). Las puertas pintadas de marrón... dan bastante sensación de viejuno. До автовокзала 15 мин. В историческом центре Хероны. Doskonała lokalizacja na starym mieście, cicho, spokojnie, czysto. Nie daleko na dworzec I do autobusu na lotnisko. Wszystko na odległość spaceru. Very close to the historic centre though it was tucked up a narrow street and I nearly missed it. The room was very small, clean, basic, with shared facilities which was ok just for an overnight. I missed the note on the door and walked around all afternoon with my heavy backpack. I returned only to find the door still closed. It was only then I saw a notice concerning Booking.com and a number to call. As the person I rang hardly spoke a word of English communication by mobile phone (which they presumed I had), was difficult. However, the lady arrived within minutes. The room had no window. The radiator clicked on and off all night, and the locks on the doors echoed right through the building because of the tiled floors and absolute lack of any soft furnishings. Приехала я в этот отель на такси, но, как оказалось, персонал не сидит в этом здании и на входной двери было написано на испанском языке куда пройти, хоть это и не далеко, но по брусчатке с чемоданом не очень удобно! Вышла женщина и провела меня в мой отель,женщина не говорит на англ языке!!! Комната ОЧЕНЬ маленькая, в комнате кровать и стул, даже зеркала нет!!! Слышно всех соседей, как будто они рядом, а не за стенкой! НЕТ ИНТЕРНЕТА!!! В здании не ловит мобильная связь, ни украинские операторы, ни испанский!!! Одним словом УЖАС!!! Даже остаться на 1 ночь перед перелетом не советую, выспаться не возможно!! !